Damnoen Saduak Floating Market (DSFM) offer exclusive private tours to Damnoen Saduak with a chance to combine your sightseeing with the Grand Palace and Wat Phra Keo in Bangkok. Damnoen Saduak is the most famous floating market in rural Thailand, located a short distance southwest of Bangkok. At the market you will find female traders, often wearing traditional clothing with wide-brimmed straw hats rowing small wooden boats laden with farm produce, vegetables and fruits, etc. DSFM only use professional local guides, all licensed by the Tourism Authority of Thailand. The director of DSFM contacted me through my website with the request for a website redesign of their previous website. After a website consultation over Skype we drafted a plan together. 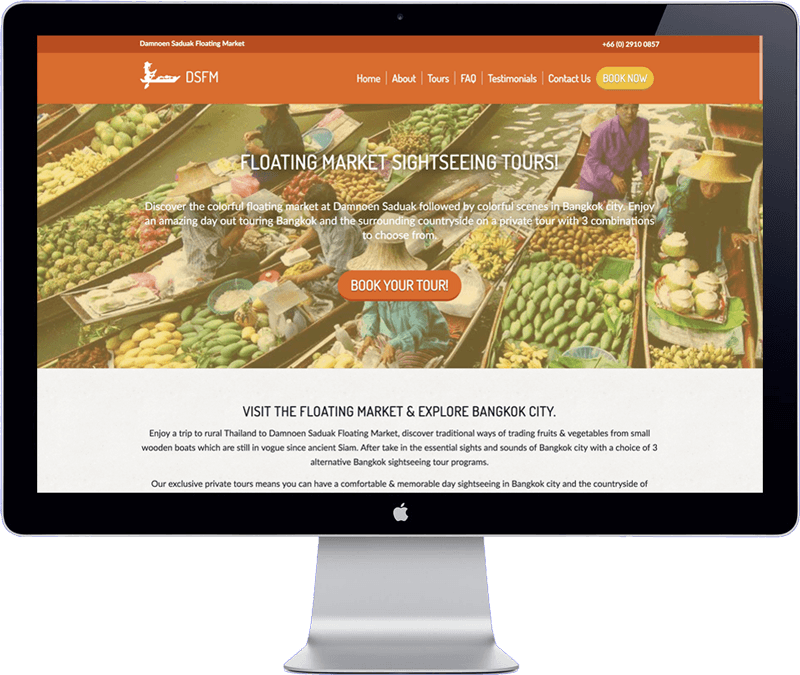 The new website design reflects their brand identity, it informs visitors about their tours and has call to actions placed all over the website design to book a tour easily. The website is simple to update and heavily optimized for search engines (SEO). The website has been developed with WordPress Content Management System. The customer received training on how to update the website.